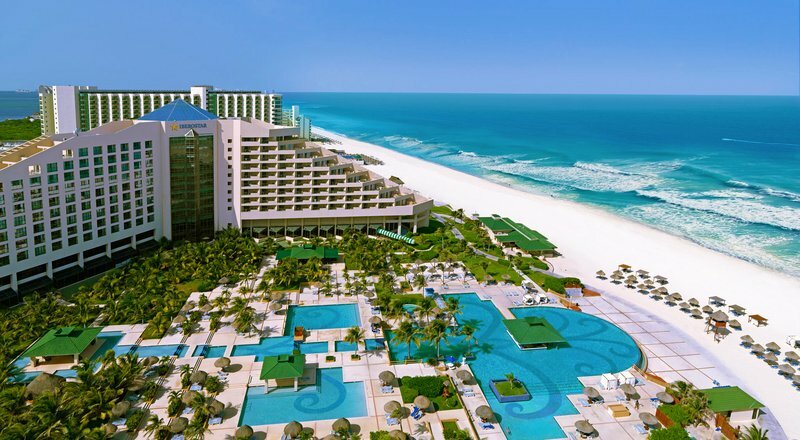 The IBEROSTAR Cancun (All Inclusive 24hr) property is a 5-star resort located only 15 minutes from the Cancun International Airport on one of the finest beaches in Mexico. This property has 426 guest rooms which includes 224 Standard Rooms with ocean view, 99 Standard Rooms with ocean view and balcony, 16 ocean view Suites, 28 ocean front Villas, 54 Junior Suites, 4 Master Suites and 1 Presidential Suites. There is free access to WiFi in all rooms as well as room service. There is also a convention center available for conferences. There are many dining options available including 4 specialty restaurants, 1 buffet restaurant, 5 bars, and 1 snack bar. 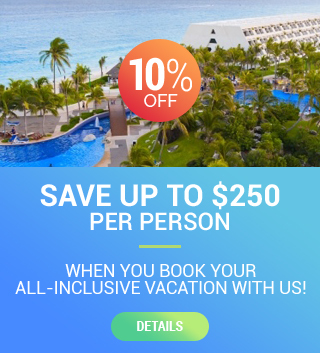 The buffet features traditional Mexican as well as international dishes and the specialty restaurants include Mexican, Japanese, French, and Steakhouse cuisine. If you would like to stay fit while on vacation, the property does have a gym and health club. For fans of golf, this resort is the only property in the area that has an onsite 18-hole championship golf course. Additionally, other sports and activities including tennis, volleyball, ping pong, riflery, water polo, and scuba diving are offered. Experienced dive masters are also available so you can get your PADI diving certification. Stay relaxed at this resort with a trip to SPA Sensations which offers a full range of spa services. Such services include massages, facials, and therapies. There are many entertainment options for both children and adults at this property. Kids stay entertained by use of the Splash Park, kids club, mini disco, kid’s pool, teen’s club, and group painting classes. For adults, options include The Evening Spectacular (Theater performances), live music, and karaoke. There are also daily activities programed for the entire family.